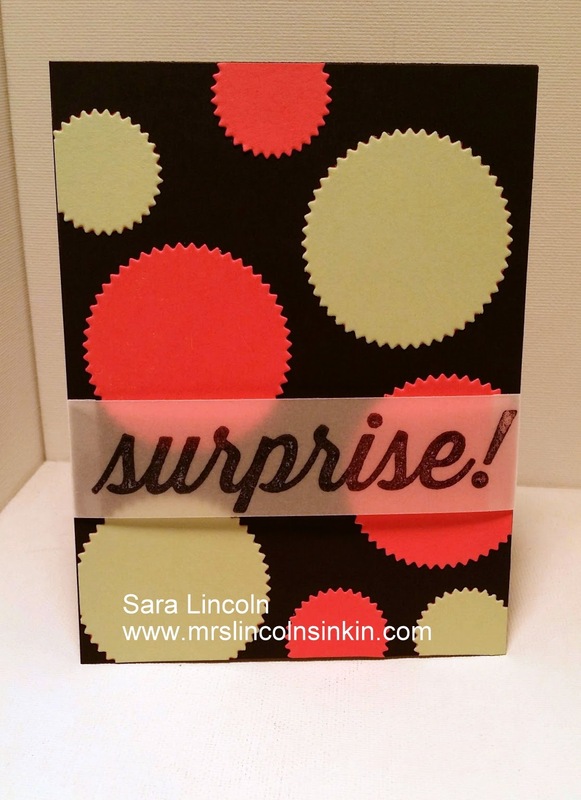 This card measures 4 1/4" x 11" and then scored at 5 1/2" and is in Basic Black. I used 2 colors that are on the retiring list, Strawberry Slush and Pistachio Pudding along with the Starburst framelits. I love the Starburst framelits and am sad to see them go. I used two different size framelits and then just arranged them around the base how I wanted them. Then, for my greeting I chose Birthday Surprise and placed it on a piece of Vellum Card Stock with some Black StazOn. And that is that. Pretty simple huh? So, what item am I showcasing today you ask... since I used so many retiring items. Well, I thought today I would showcase the Birthday Surprise stamp set. Don't forget to check out all the other items that are on the RETIRING LIST. Accessories are sure selling quick so don't wait too long to stock up. To allow everyone a chance to get some of your favorite items you can order your favorite items at up to 50% off. But, items will only be available until June 2nd and it's only while supplies last (on accessories), stamps will continue to be made until May 26th due to the high demand.